The second in a series of three 10"s from Olympia freak-folk-jammer Lee Baggett. 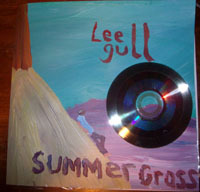 You may know Lee from his tours and recording with Little Wings or as one of the core members of Be Gulls. Comes with a unique 10"x20" oil painting by Lee himself and a lathe cut cd-r with a bonus track (playable on your turntable) on the "b-side" of the cd.